Conventional loans are mortgage loans offered by non-government sponsored lenders. A conventional, or conforming, mortgage adheres to the guidelines set by Fannie Mae and Freddie Mac. It may have either a fixed or adjustable rate. While many think that a 20% down payment is required for all conventional loans, we have options for as little as 3% down. Dan Palumbo is a leading provider of conventional loans in Glen Ellyn, Wheaton, St Charles, Geneva as well as the whole state of Illinois. For more information on conventional loans and how to qualify, contact me today at (630) 842-3733 or fill out the quick quote on the right. A conventional mortgage is your standard mortgage which requires a 620+ credit score and a down payment of at least 3%. We specialize in Conventional Loans and are recommended by many Local Real Estate Professionals and Attorneys. What are the benefits of Conventional Loans? There are many benefits of a Conventional Loan and we will recommend which loan program is best for our clients based on their unique scenario. I will explain your options and help you decide which loan program best suits your needs. How to qualify for Conventional Loans? We’ve made qualifying for a Conventional Loan quick and simple with our streamlined application process. Some of the documents that you will need for the final mortgage approval are your recent W2s, Pay Stubs and Bank Statements. We have many Conventional Loan Programs that are designed to help keep your mortgage payments low and have minimal closing costs. The most popular Conventional Loan is the 30 Year Fixed Mortgage but we have many others which may suit you better. Contact me with questions or to help determine which program is best for you. 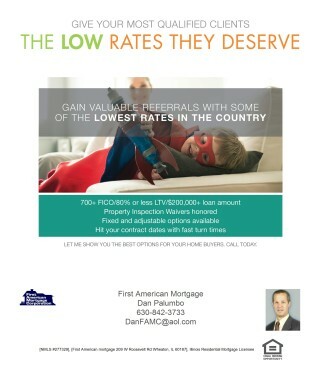 Contact Dan to get approved for a Conventional Loan today! The standard conventional loan limit is $453,100 but we have an expanded Conventional Loan Limit option up to an $850,000 Purchase Price if qualifying factors are met. Get Approved for a Conventional Loan Today! Dan Palumbo is a leading provider of conventional loans in Glen Ellyn, Wheaton, St Charles and Geneva as well as the whole state of Illinois. For more information on conventional loans and how to qualify contact us today at (630) 842-3733 or fill out the quick quote on the right.